A story set in Victorian England has all the elements to draw me in: elaborate clothing, strict rules of behavior, upper-class people who think they are above the law, and lower-class people who silently observe and keep society running. 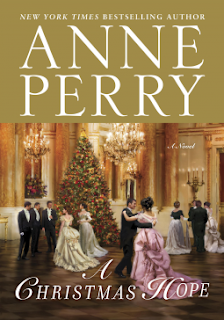 Anne Perry, whose William Monk and Thomas Pitt characters form the basis of many of her novels, has a new mystery set in the same time period titled A Christmas Hope. Although none of her more familiar characters makes an appearance here, the main character, Claudine Burroughs, volunteers her time at the clinic for fallen women that Hester Monk founded. The story begins with Claudine and her somewhat overbearing husband Wallace attending a winter party at the home of one of their society acquaintances. During the party, Claudine steps outside for some fresh air and makes the acquaintance of Dai Tregarron. Tregarron is notorious both for his poetry and his drunkenness, but his thoughtful conversation intrigues Claudine. Not long after, a young prostitute is found grievously injured outside the house, and some of the young men present claim to have seen Tregarron strike the woman. She is taken to a hospital, but in the confusion, Tregarron disappears. Not long afterwards, the woman dies, and Tregarron shows up at Claudine's house, asking for her help in proving his innocence. Claudine doesn't know where to turn to accomplish this, but luckily she is able to call on the assistance of one Squeaky Robinson. Squeaky has a less-than-squeaky-clean past, and so is a good person to enlist for questioning people from the lower echelons of society. He works with Claudine at the clinic and they have established a grudging respect for each other. Claudine has, in common with Hester Monk, a strong sense of what's right and will do whatever is necessary in order to see that justice is served. This streak of stubbornness and independence puts her at odds with her husband Wallace, who wishes his wife would be a bit more compliant and conventional. Even though he blusters and forbids Claudine to get involved, when she disobeys him, there are no consequences. They live separate and at times opposing lives and so Claudine must find her sense of worth and happiness in her work at the clinic (and solving mysteries!). I wish the Monks had made an appearance in this book, but it was not to be. I found Claudine to be an admirable and strong woman, but I found Wallace's blustering and attempts to control his wife somewhat puzzling. He presumably had the power to exert more control over her if he chose to do so, but instead, he seemed to just shout and turn red a lot. Still, all ends up being put right at the end, and Claudine continues her work at the clinic no matter what Wallace has to say about it! Overall, fans of Anne Perry will enjoy this Victorian-era novel where the women have to do all the work to keep society on the straight and narrow.